Clacton-on-Sea, UK - Mercury wetted relays remain a good choice for some applications due to the fact that they have no contact bounce, have a high power rating and offer a very low and stable contact resistance, with over one billion operations. While they do not meet the requirements of the RoHS directive, there are many applications that are exempt from this, for example, medical equipment, instrumentation, military applications, servicing, upgrading or expanding pre RoHS equipment. One special application involves relays featuring two change-over switches with a common open time. These are used in data acquisition systems using the 'Flying Capacitor' technique, this gives superb isolation between the source and the device measuring it. Pickering Electronics manufacture a very wide range of mercury wetted relays, from large high power devices to very small single-in-line types. 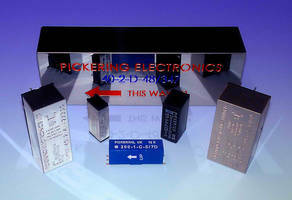 Visit our website, www.pickeringrelay.com, or contact our factory for samples. Many mercury types from other manufacturers are no longer available so if you have a mercury relay requirement, contact Pickering. Pickering Electronics was formed in January 1968, with the aim to design and manufacture high quality reed relays, intended principally for use in Instrumentation and Test equipment. Today, Pickering's Single-in-Line (SIL) range is by far the most developed in the relay industry with relays 25% the size of many of their competitors. The small SIL relays are sold in high volumes to large ATE companies throughout the world.